This post was sponsored by Veetee Foods, Inc. However, all opinions are 100% my own. It’s almost impossible to cook something for lunch with two toddlers at home. If they’re not insisting on being held, they’re wanting a cup of water, or they need a pacifier, or they want whatever it is that the other one has. Seriously, the struggle is real for any 18-month olds and 3 year olds living in our house, apparently. So, I have been trying to come-up with super-simple meals that are still amazingly yummy–because life with a boring lunch is just not worth living. My latest creation? This awesome 2-Minute Fried Rice with Mock Tempura Shrimp Balls. Yeah, you read that right. Two minutes to a bowl of fried rice and some faux-sushi. Best. Lunch. Ever. I was whipping this together with this yummy rice I found at Kroger, Veetee Dine In Long Grain Rice, and, let me reassure you, this was so easy to work with. I was a little skeptical at first, because, you know, anything that’s ready in just 2 minutes can’t be good, right? WRONG. 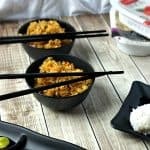 This 2-Minute Fried Rice and the Mock Tempura Shrimp Balls are perfection–even if they did take less time to make than it did for me to eat them. So inspired by how well this 2-Minute Fried Rice turned-out, I tried making 2-minute Mexican Rice with the Veetee Dine In Risotto. Also brilliant. So, just FYI–kind of in love with Veetee Dine In Rice right now. And, because I love you, there’s a giveaway. Ok, so you entered the giveaway, right? Ok, now for the recipe for the 2-Minute Fried Rice with Mock Tempura Shrimp Balls. 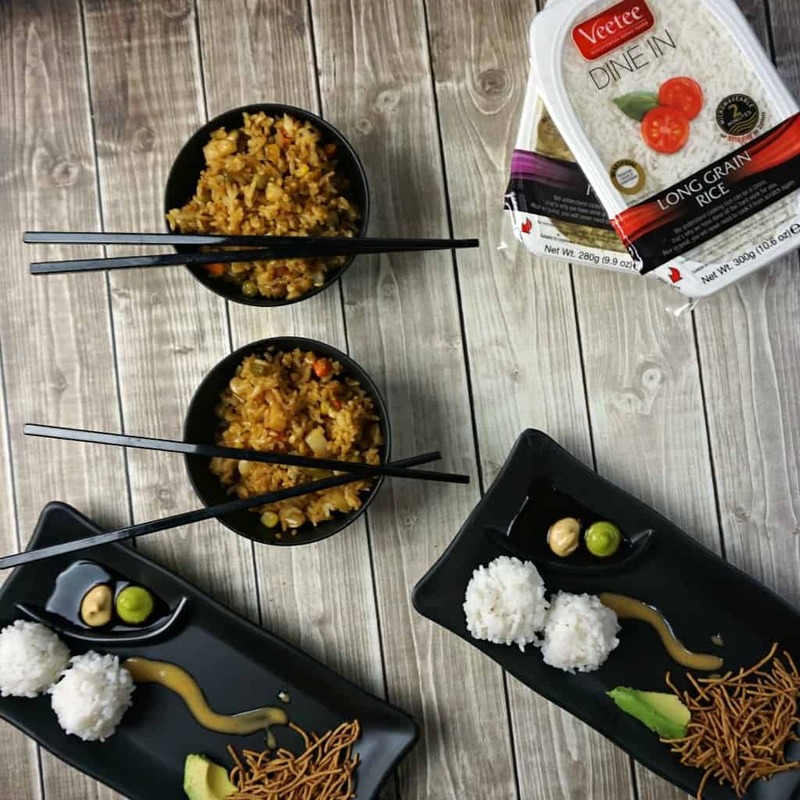 First, head to Kroger and get your Veetee Dine In Long Grain Rice and the other ingredients. Then come back and whip this up–fast. It’s so good, you’ll be wanting to make it every day for lunch. Because this is such a simple recipe, I made you a little photo tutorial–you know, for those of you who enjoy driving without a map. And, for the rest of us, here’s written directions (you can thank me later). My latest creation? This awesome 2-Minute Fried Rice with Mock Tempura Shrimp Balls. Yeah, you read that right. Two minutes to a bowl of fried rice and some faux-sushi. Best. Lunch. Ever. 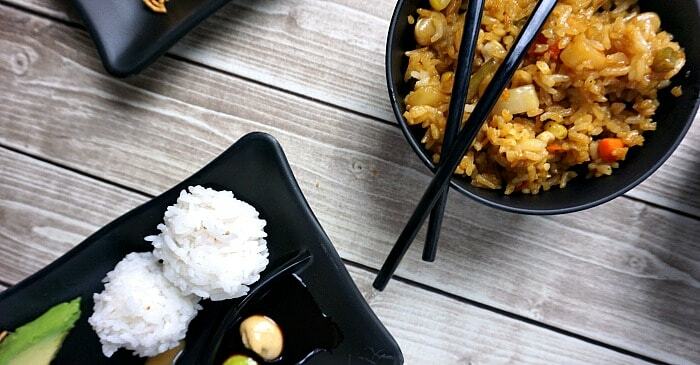 For the Fried Rice, place the stir fry oil or vegan buttery spread in your wok over high heat. Immediately add the soy sauce. Once hot (which should be quite fast), add the rice and salt & pepper. Stir for one minute, add the vegetable medley. Stir until everything is hot (one more minute). For the Mock Tempura Shrimp Balls, simply place the shrimp in the microwave for 30 seconds. Follow the directions of the Veetee Dine In Long Grain Rice to cook it in the microwave (2 minutes). Remove rice and allow to cool enough so that it is safe to handle. In one hand, pack rice around one shrimp, compressing it into a ball. Repeat for all 4 shrimp. 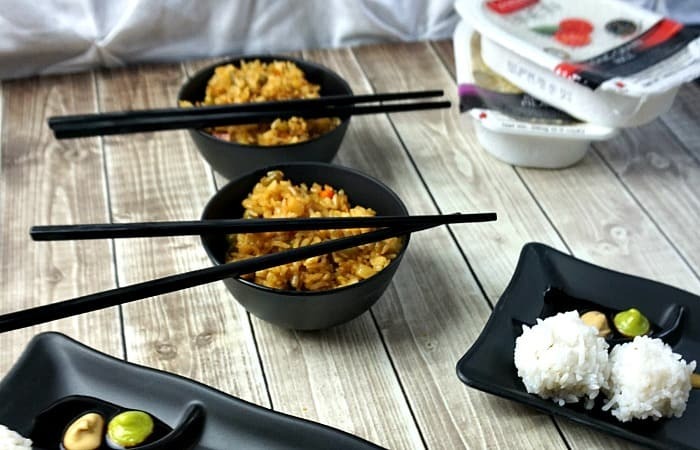 Place on a nifty sushi plate with soy sauce, wasabi and yum-yum sauce, then serve to your date--and let them think you know how to make take-out at home! LOL!